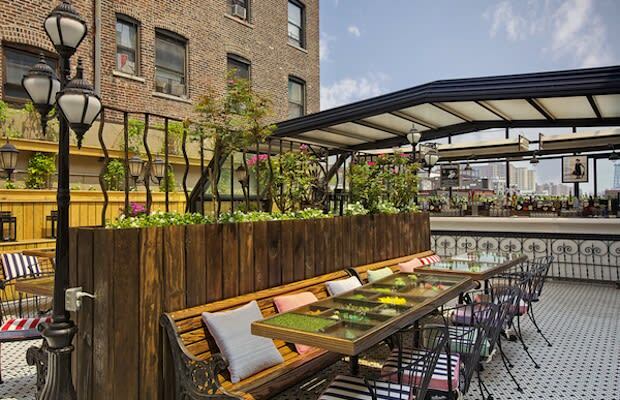 Set just apart from the hustle and endless flow of traffic on LES's main stretch between Stanton and Rivington is Hotel Chantelle, which is not a hotel, but a gorgeous tri-level space with a rooftop patio that will woo even the most hard-to-impress girlfriend's pants off. Start early so you can catch their "High Life" happy hour (which in case you were wondering, does not refer to the champagne of beers) before heading up the outdoor space on the second floor, where she'll happily sip on a specialty cocktail like their Sarth Sangria, a rosé sangria made with fresh fruit and Pyrat rum. After you've spent a few minutes lounging in the sunshine and gossiping about the Olsen-esque fashion aspirations of the crowd, stumble down to the basement for some bumping and grinding. Admit it, after a few glasses of rosé, making out in public somehow seems like the right move.